We had a good day on Friday visiting the tulip fields in Skagit Valley (Washington State). The day was perfect in many ways: not too hot or too cold, plus there was a breeze and a light cloud cover so it wasn’t too hot for the dogs. 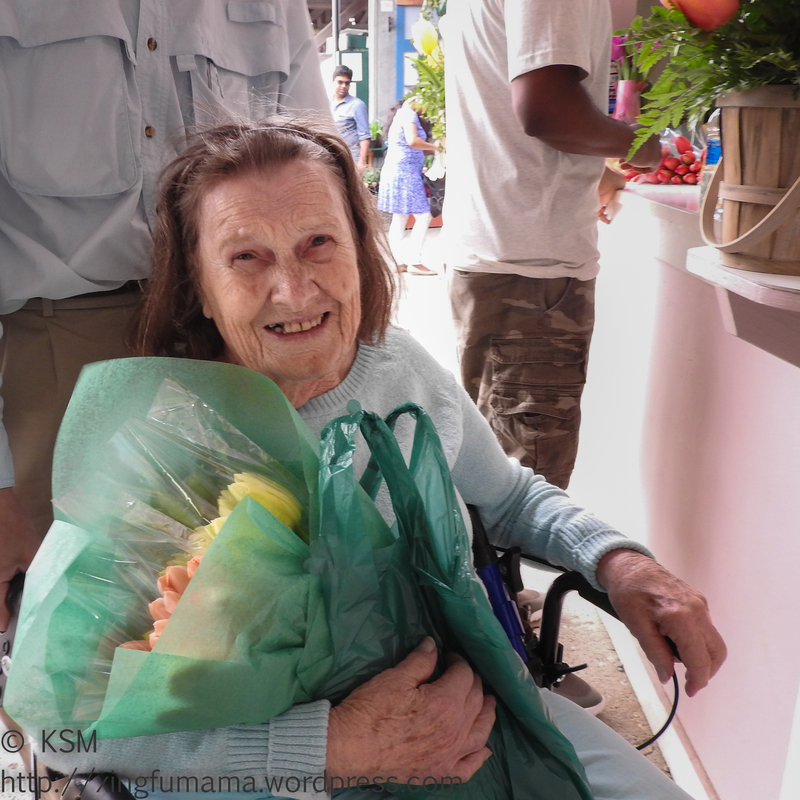 Managing the deeply rutted roads and the gravel was a bit challenging with the lightweight convertible walker/wheelchair, but we managed to get Grandma close enough to some of the flowers to feel like she was there. As a bonus: we saw this field of snow geese (?). At first glance it looked almost like a field of white flowers a little past its peak. As Grandma’s heart is not in the best shape, it felt important to fit this outing in before I take off for a couple of weeks. We did have one scare: she couldn’t get up from the toilet unassisted at the restaurant where we had lunch, and I had no clue how to assist. We managed in the end, but not on the first try, and I was running through the “what should we do next” scenarios in my mind before we had success. It really made me aware of her vulnerability…and how glad I was that we did this trip. Who knows how things will go in the future. But, however they go, we had the time together enjoying the fresh air and beautiful surroundings. Wishing you beauty and joy in the coming week…and if you know what kind of birds we saw please share.